Can Islamic and Christian law coexist? Should they? 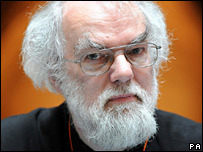 The Archbishop of Canterbury, Dr Rowan Williams – who has to have been a Unix Sysadmin at some point – says the adoption of certain aspects of Sharia law in the UK “seems unavoidable”. His comments have attracted a great deal of criticism and hostility from all faiths and political leanings. Britain used to have the largest Empire in the world. While those days are long gone, the Commonwealth of nations that used to comprise the Empire retain strong links with Britain. Additionally, Great Britain is an EU member state. This means that, since we’re one of the richest members of either of those two groupings, we get more than our share of immigrants. To make my stance clear, I have no problem with the concept of immigration – to a point. I am all for people coming to this country, obeying our laws and paying their way. Society benefits from change. A society that deals with change in a positive way is a rare and wonderful thing. I’m generally against people who come here to enjoy the benefits of our welfare state without making any effort to earn those benefits. This goes equally, if not more so, for British people who fall into this welfare-sponging category. This rather unilateral stance doesn’t help those people who are maimed, or irretrievably stupid, or who face death if they go back to their own country. Society generates these people, so it is the responsibility of Society to look after them. Britain is predominantly Christian country and our rules are based, in part, in the statements made in the Bible; thou shalt not kill, thou shalt not steal and so on. It is also an immensely traditional country, traditions that have acquired the weight of law over the centuries. We now have a good proportion of people who do not recognise the British Rule of Law first and foremost. In the case of Muslims, their Sharia law is derived from the Koran and the life of the prophet Mohammed. Since the system of belief seems to be synonymous with their system of law, their obeyance of Sharia law will inevitably find them in violation of the law of the land; Britain in this case. I am kinda on the Dr Williams’ side when he says that certain elements of Sharia law may need to find themselves into British law. However, this is Britain and the addition of Sharia law should not weaken British law. Where the two are in conflict, I think that British law should prevail. If someone has come to a country, they should accept that sacrifices have to be made. Having written that, I can understand that Muslims view Sharia law as inviolable. If the situations were reversed and there were a Christian enclave in a Muslim country, I doubt that that country would alter their system of law to accommodate other beliefs. I think this stems from the fact that Islam is a more rigorous religion. Christianity is much more relaxed in it approach. Muslims are required to pray daily, observed certain restrictions in diet and attend the Hajj at least once in their life. Christians have no such requirements. In conclusion, I think that elements of Sharia law would doubtless strengthen British law, due to its roots in the strict Islamic faith, but this should not be to the detriment of the British system of law and the absolutes that it’s citizens understand. Likewise, we should welcome those elements of immigrants’ society that enrich our own, but reject those that do not. And if you don’t like it, you know where you can go.